When it comes to tumbling there are at least two approaches….."Just throw it" and then there is "Let’s Do It Right". I am a fan of the latter. As a tumbler for more than twenty years now I have seen a lot of different, we will call them “styles”, of tumbling. Some work for really talented kids, some work for really flexible kids, some work for the trampoline kids and some work for the doggedly determined kids. 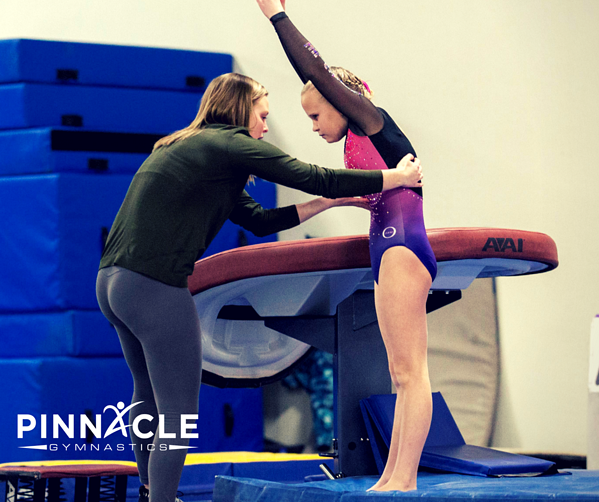 My approach is to teach tumbling in a consistent, growing, and kinesiological way. (what does that mean Coach Heath? More on that later.) Teaching with this philosophy has posed challenges, but I truly believe it is better for the athletes overall progress. How long does it take to learn a back handspring? 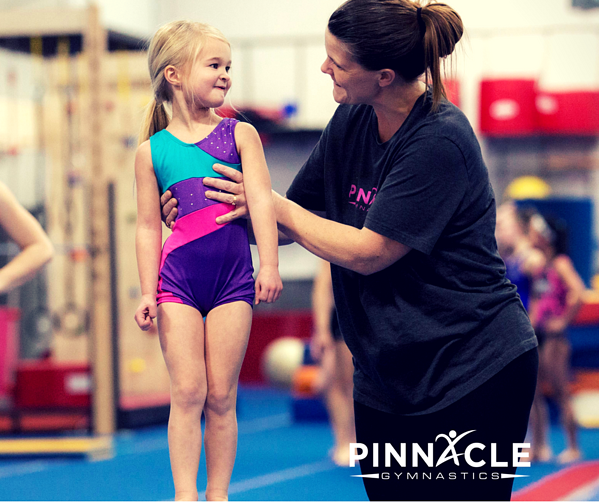 Teaching a new skill in tumbling is a 6-12 month process for the average athlete that signs up for a tumbling class. I usually get to spend 30-35 good skill training minutesa week with my athletes. My typical athlete is enrolled in a weekly 50 minute class, attends at an average of 3 weeks a month. So out of that short 6 month training time I might get 9 good hours if they are healthy, focused, and “bought in” to the program. That is not a lot of time to actually effect change in behavior let alone create a skill out of thin air. Think about a basketball player who only shoots free throws once a week for about 45 seconds, Unless they have a somewhat unique talent for it, it will probably take a long time before they can sink it methodically. Tumbling is complex and can be dangerous to learn and, as with all things, there is the quick way, i.e. using shortcuts and there is the committed way. I really believe that kids have unlimited potential, it only becomes limited by those that surround them. Positivity and negativity are both contagious. Success as well as failure are constructs of how you view and accept them. I like to compare this to cramming for an exam vs actually internalizing the information for life. If I learn the alphabet by only singing, then in order to recite it I will have to sing, but if I truly know the alphabet then I can say it forwards, backwards, start in the middle, even skip vowels. Many of my athletes may not be thinking long term but it is part of my responsibility to prepare them for the best possible outcome or better yet, what they can ultimately achieve. What is consistency in training? Consistency in training means doing the same things over and over again in order to gain a proficiency in that skill, drill, trick, or pass. I typically start all of my tumbling classes with the same warm-up and the same stretches. Now this might get “old” after 4 to 5 months but they know how to do the warm-up and what stretches we will be doing. Many of my drills are standard and look easy to do, but when you really start breaking them down the more complex the movement pattern may or may not be. I look for them to get better at the warm-up and gain flexibility during stretching all the while training for the end result. All across the United States a McDonalds cheeseburger will taste the same no matter if you are in a small town or large metropolis. What is growing in training? Growing in training means having short term, mid-term, & long term goals that may go farther than the athlete can comprehend at this time. If I took a 9 year old athlete that doesn’t know how to do a cartwheel and tell them that in a few years they will be doing a front handspring roundoff back handspring layout full twist series, they might not even know what half of those words mean let alone what those tricks look like. I train my standing back handspring so that when they do their round off back handspring there is not a difference in body shape. Utilizing the same lunge shape for a handstand, cartwheel, front handspring as well as a front aerial step out will lead to less re-learning and thus getting the trick faster. If you have a strong understanding of counting, then math is easier, but if you cannot tell which number is greater...math is hard. Kinesiological = told you I would get to it. I use basic kinesiology in training athletes, or in other words, I use the muscles that should move the body to move the body, the muscles that should stabilize the body to stabilize the body, and power that is generated from the body vs generated from outside the body to teach tumbling, body awareness, and flexibility. Not all of my peers agree with my techniques, and most of my students get glossy eyed when I explain how one muscle controls this movement then transfers its energy to this section of the body and if that section is strong and tight the power or energy has to go to the next section of the body which is what I am asking you to do. With that being said, when they do “get it” it makes for positive learning. Throwing a back handspring is a really bad idea in my opinion. Throwing involves motion and release...what are you releasing when you throw your body backwards? And the motion, backwards and down...hmmm. To me that sounds like a ton of impact on the surface with potential injury to a number of body parts. Anything that isn’t tight is loose, therefore it can bend or flex. The question is should that body part bend or flex due to impact? I would prefer an upward and backward jump while pulling the hands behind the ears with straight arms and a tight torso, thus creating a lift of the body while turning over to a near vertical handstand. Then springing off the hands by contracting the hips (only so far as to snap from a slight open shape to a slight hollow shape) and extending the shoulders, subsequently pulling the torso up on top of the feet. Yes, I’ve heard a lot of people tell athletes to pull their feet under the hips/chest (which creates a pike in the hips), therefore I do not use that language or really do any drill that promotes that. If you pike something then you usually have to to un-pike. I like to think of the body as having rigid-flexibility, it can flex and return to shape like the a pair of skis, but bending or having and angle to the body is much less efficient, and apply too much pressure on something and it will break. My overall goal is to teach an athlete that good tumbling does not rely on the surface that they are tumbling on, but relies on learning how to move the body effectively on any surface so that the skills and tricks are transferable to the basketball court, the football sideline, the track, the parade route, the beach, or the spring floor. Each of those surfaces are vastly different from each other and depending on what you are doing on them can be more or less difficult.